BOE’s CEO stated at the BOE Global Innovation Partner Conference that the company aims to produce 50m flexible OLED products for the mid-to-high-end smartphone market next year. 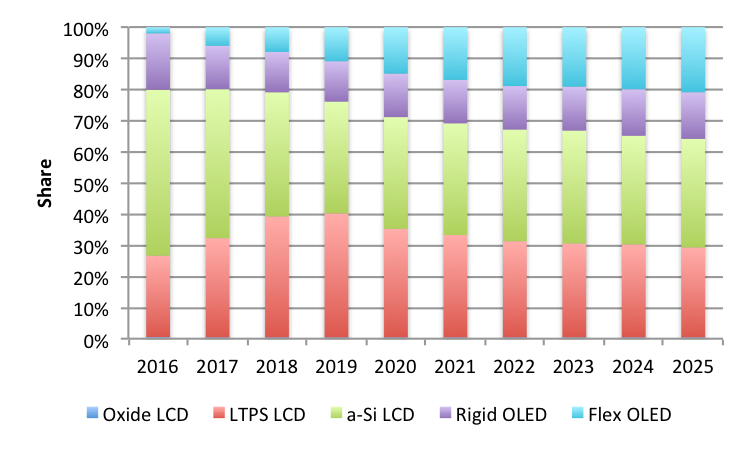 Since BOE only shipped 1m OLED displays in 2018, the goal is a bit of a stretch. However, as shown in the next figure, BOE has 1 6thGen OLED fab in operation, 1 start MP in 2019 and 2 more being planned. ​BOE’s issue with reaching their goal of 50m units in 2019 is raising the yield, which is probably less than 1% as indicated in the next table. The table shows that Samsung is the leader in capacity, production and effectiveness (yield * utilization), which was low in 2018 due to the under utilization in the 1sthalf due to the Apple shortfall. IN terms of OLED production, Samsung has a 93.2% share, followed by LG Display at 3.0% and Visionox at 1.9%. BOE had only a 0.2% share in 2018. The next table provides an example of mid to high-end smartphone panel prices. In terms of rigid LCD vs. flexible OLED, the comparison is mute because the panels are so different but he premium for flexible is 4X. Comparing rigid panel with low resolution, LTPS LCD has a 40% premium over a-Si LCD. IN the case of rigid LCD vs. rigid OLED, the premium tracks the resolution more than the technology.